This post was written Anthony Dang, by a dear friend and a lover of all things bees. Grateful to have his passion and expertise on my blog – hope you all enjoy! Spring is upon us, and the Earth’s creatures are beginning to come out of hibernation. Honeybees that retreated to their hives to stave off the cold will start venturing out to forage for food, and queen bumblebees that burrowed for the winter will search for habitat to start new colonies. Now is the perfect time to consider why bees are so important and what we can do to help stop the serious population decline. Health of the planet. Bee pollinators act as keystone species in a rich ecosystem, not only for plant pollination, but also for forming the basis of an energy rich food web. Many fruits and seeds derived from bee pollination are responsible for feeding a wide range of species, from birds to grizzly bears. In many ecosystems, certain plants thrive from wild bee pollination. Without adequate bee pollination these plants risk having fewer progeny or even going extinct. The Economy. Honeybees alone contribute an estimated $15 billion to the US economy and an estimated $235 billion worldwide [ii],[iii]. The number of honeybee colonies in the US has decreased drastically, from 4.5 million colonies in 1940 to 2.5 million today. One example of honeybee disruption and its consequence to the economy is the almond industry. Honeybee colonies sold to almond farmers have tripled in costs. These farmers in California used to pay $51.99 per hive in 2003, and in 2009 paid $157.03, raising prices for domestic almonds [iv]. This is because it costs beekeepers more money to replace hives that have collapsed. Honey and wax industries have taken similar hits to their business as the population of bees decreases. You. Einstein had predicted we would all perish within four years if bees go extinct. That is no longer believed to be true. Without bees though, our diets would be much less vibrant and varied. Over the generations our diets have shifted from wind-pollinated crops to insect-pollinated crops. Some of these bee-benefitting foods we love are avocados, almonds, blueberries, apples, and many more. Farmers could still produce crops (such as cereals) that manage without bees. However, they may not even be able to farm those effectively without the extra income from the high-value insect-pollinated crops that previously supported their farm. On top of that, animal fodder would suffer without bees, resulting in less meat and milk production. Continuing bee shortages could mean losing healthy variety in our diets and having food become much more expensive. Pesticides. This is the big one we hear most about. Neonicotinoids are a seed dressing that is taken up by the plant and wards off pests. In theory, this should have been safer for our bee friends because they wouldn’t be directly exposed to insecticide sprays anymore. It was discovered later that the neonicotinoid seed dressing didn’t stick to the seeds effectively. This produces highly toxic dust that is blown onto the pollen bees are eating, weakening their immune systems[v],[vi]. With weakened immune systems they are more susceptible to disease and mites. Disease and mites. A factor that promotes colony collapse disorder in honeybee colonies is the Varoa mite, one of many pests. These pests are able to transfer a host of different viruses to the bees. Researchers have mapped worldwide beehive losses that correlate with locations the Varoa mite is found. Mites as well as other diseases are transferred from hive to hive around the world through human shipping of beehives for agricultural purposes. To compound this issue, domesticated and diseased bees inevitably spill back into the wild, leaving their disease-causing microbes on flowers for wild bees to pick up[vii]. Bumblebees experience the same thing with their own specific diseases. Habitat Loss. Urbanization is a pretty obvious cause of decreasing bee populations, but doesn’t get as much focus. Neonicotinoids get the most attention because they have a simple solution: ban them, which some European countries have already done. Undoing the negative effects of urbanization is a more puzzling question. Our modern life with it’s farmland, cities, and sprawling suburban lawns have damaged habitat and fragmented where bees live and where they can find food, putting nutritional stress on them. These are just a few threats bees face, not to mention monsters like climate change, monocultures, and decreasing biodiversity. It’s popular to romanticize the idea of saving bees, but it’s much less common to see people actually doing something about it. But there are three easy ways you can help! Use fewer pesticides. If you’re a gardener, don’t use pesticides that could harm bees! Try natural home remedies instead. When you’re in the grocery store, shopping organic is an easy way to support sustainable and safe agriculture for bees. Create Habitat. Planting diverse native species in your gardens is an important and fun way to help bee populations where you live. Some bees are dietary generalists, meaning they’re equipped to forage food from a variety of flowers. Others are pollen specialists; these bees are equipped with certain traits like a long tongue for tubular flowers or an extra small body size to land on flowers their size. 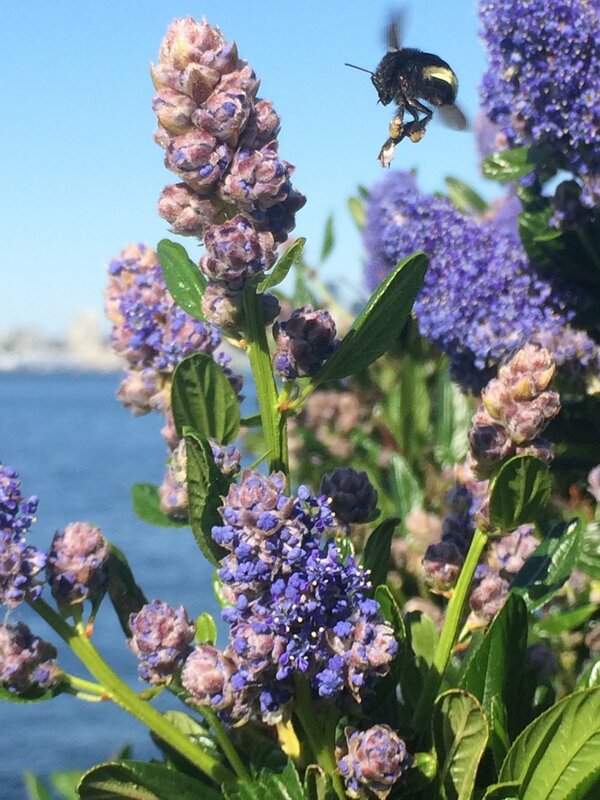 Planting a wide variety of native flowers means you’re feeding all the bees in your backyard. VOTE! This is the easiest and most important way to protect bees and the health of our planet. Vote for initiatives that support creating urban gardens, green space, and pollinator habitat in and around your city. Vote with your dollar by buying from organic farms. Vote for politicians that believe in climate change! Flex that voting muscle and make sure you’re letting your voice be heard! The recent political climate shift in the United States has brought hope to some, and uncertainty and worry to others. Whatever lies ahead, each of us has the power to help shape the world we want to live in. It’s more important now than ever before to be educated about how the health of the planet, pollinators, and us are all connected. For more information on this topic and good organizations to donate to, check out the links below!